Summary: Onion lovers will enjoy this fresh take on the ever-popular onion dip, turned into an appetizer pie with a potato chip crust. Although it looks like a pie, it is essentially still a dip and should be served with raw vegetables or more chips. 1. Lightly oil a 9-inch pie plate or tart pan or an 8-inch springform pan. Grind the chips in a food processor until they are fine crumbs. Reserve 2 tablespoons of the crumbs and press the remaining crumbs into the bottom of the prepared pan. Set aside. 2. Place the onion, shallot, and scallions in a food processor and process until minced. Add the cream cheese, sour cream, parsley, mayonnaise, mustard, Tabasco, and salt and process until well combined. Spread the onion mixture evenly over the crumb crust and smooth the top. Cover and refrigerate for at least 2 hours or overnight. 3. Just before serving, arrange a border of cherry tomato halves along the edge of the pie. Then arrange a ring of olive halves inside the tomatoes. Repeat with additional concentric rings of tomatoes and olives, if desired, leaving the center of the pie uncovered. Sprinkle the reserved chip crumbs in the center and serve. 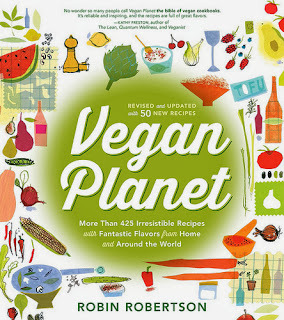 The popularity of the vegan cooking movement cannot be ignored. From home kitchens to restaurant tables, to cookbooks and new food products, consumers have embraced veganism as a leading part of the culinary lexicon. But, even with all the focus on vegan-friendly lifestyles, there are still large portions of the culinary public that either don’t understand or appreciate the health benefits, eco-friendliness, and creative recipes that can be achieved through vegan cooking. With World Vegan Month upon us this November, leading vegan cookbook author and culinary expert Robin Robertson has put together “30 Days of Vegan Cooking,” a consumer-focused campaign to get more people cooking vegan in their kitchens. Whether a new or advanced vegan cook, or someone who wants to incorporate vegan dishes a few nights per week, home cooks everywhere will find Robin’s 30 day program a creative and accessible way to explore new tastes in vegan dishes. With the upcoming launch of her revised VEGAN PLANET, the bible on the subject of vegan cooking, Robin has time and again demonstrated how vegan recipes can embody a fresh and contemporary approach to veganism. And with the newest edition of her book coming out later this Fall, Robin incorporates new techniques and ingredients to help any kind of cook (vegan or not) enjoy a healthy and flavorful meal, with all the benefits of the vegan lifestyle.